Do you use a landing page builder to build highly converting landing pages? If you don’t really do it, you should. Because using landing pages can make a huge difference in your conversion rate and sales. As an internet marketer, you must know the importance of conversion rates. If you are getting hundreds of thousands of visitors but you are not able to convert them into customers then you will not get anything. Now that you know the importance of landing pages and you are interested in trying you your hands with a landing page building software, right? But the question is; which one is the best landing page builder, either GetResponse or IM Creator? Don’t worry, we have the right answer. Today in this post we are going to compare the features of both, GetResponse & IM Creator. After reading this post you will be able to decide which one is a better choice for you. Today in this post we are going to compare the features of both, GetResponse & IM Creator. After reading this post you will be able to decide which one is a better choice for you. GetResponse is one of the best email marketing tools that is used by a number of business. It is considered as the best email marketing tool because of the distinctive features it provides. The matchless features of GetResponse are available to their customers in the most reasonable pricing. Moreover, the companies prefer to use GetResponse because it develops the best and the harmonious relationship between the customers and their businesses. It also helps businesses in connecting with current and potential customers in the best possible way. GetResponse is the only email marketing tool that allows companies to run campaigns in the most professional way and attract most customers. GetResponse tries to decrease your work load by maintaining the list of your contacts to which you want to send daily emails/newsletters. Not only this, it provides you with such information and tools that make it easy for you to reach your potential customers. GetResponse also gives turnkey newsletter publishing and hosting features, unlimited number of auto responders to deliver correct information instantly to your audience and convert them into paying customers. It gives fully automated list hygiene, anti-spam practices and established relationships with major Internet Service Providers and Email Service Providers. Due to all these amazing features, GetResponse has the highest followings as it is used in almost 180 countries. Moreover, every month, the system gets more than 1 billion users! 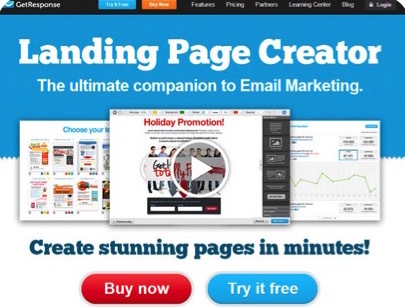 IM Creator is a website builder used for creating landing pages. It allows users to create a beautiful, image-rich website in least possible time. Hence, it is the best website builder that has the best features and tools for the creation of your website. There are a number of website builders are available in the market to help you out in creating your website. Some of those website builders have a many more tools for you to use to build a more comprehensive site. However, those tools are usually not used by most of the users! On the other hand, IM Creator is a unique and different website builder as enables you to build a very professional looking website, very quickly. If you want to have a very attractive website that attracts most people but do not have a lot of time to spend on it, you may go for IM Creator. As it is able to work by its own and does not waste your precious time. So, you may work on the other important things without worrying about your website. The best part of IM Creator is that it can work well for any type of business. It will work for the photographer, fashion, design, musician, weddings, hotels, restaurants, personal, and many other types of businesses. However, the only drawback of IM Creator is that is does not have very advanced features. So it caters the businesses which are small or the basic ones. You may define the landing page as a web page which is used as the entrance for a website or a specific area of the website. To make it easier for you to understand, a landing page serves as a web page on which visitors arrive at or land on. If we consider making a landing page for marketing or advertising purpose for a company, it can be referred as a page that is a separate and distinctive web page from your actual website. The landing page is usually designed for a separate objective of the business. We can also say that the landing page does not have any global navigation that ties it to the real website of your company. The actual reason for this is to limit the options that are available for your visitors so that they may move towards your real conversion goal. Now that we have discussed about the two applications and about landing pages, we will move further to check the “Landing Page” feature of both the application – GetResponse and IM Creator. Along with a number of other features, GetResponse provides the features of landing pages. Through GetResponse Landing Pages, you can develop a landing page in just less than 10 minutes. This feature collects the leads automatically and has no designed constraints. It does not require any technical skill or HTML & CSS coding. The landing pages of GetResponse look great on all devices including desktop computers, laptop computers, iPads and smart phones. Some of the other key points regarding landing pages of GetResponse are discussed below. Drag and drop option for images, buttons, and text box. Change the background, font of the text, and add other cool effects. Customize images and page backgrounds with 1000 free packs. Resize, crop, round the corners, or add shadows to the pictures. Use your own pictures according to how you want to see your work. Easy and cheap options are available. Power your landing page with embedded videos. Copy and paste the videos on the landing page from the YouTube. Add the search icons including Facebook, Twitter, and others. Boasts your audiences in no time. Add custom fields, action buttons, and place them anywhere. A/B testing for your ideas. 10 versions are tested to see which attracts the most traffic and bring most subscriptions. Helps in optimizing your SEO. Publishes SEO in free sub domain or your custom domain. GetResponse provides basic landing pages with its 30-day free trial and the email plan. The basic landing pages will let you publish one landing page and handle up to 1000 visitors per month. If you want to publish more than one landing pages or you have more traffic, you should go with GetResponse Pro Plan that lets you create unlimited landing pages and handle unlimited traffic. This also includes A/B testing. IM Creator also has a number of other features but we are going to discuss the feature of landing page. It allows the businesses to build their own new and exciting advertisement campaigns and landing pages. Easy and less time consuming. 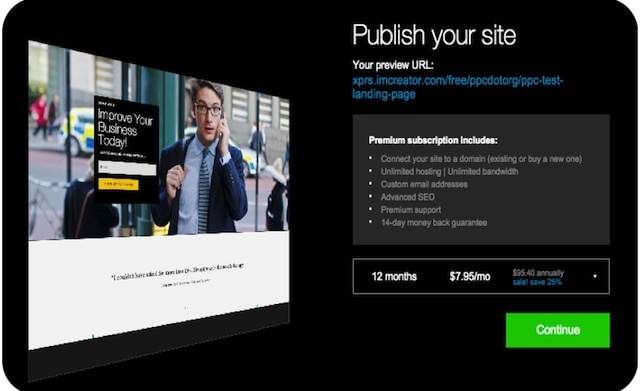 IM Creator has XPRS platform to design landing pages. Serves the new businesses also. Customizable and high quality prebuilt landing page themes. Separate categories of the themes. XPRS allows the users to move, add, and edit nearly all sections of the page and change them. Change the text, color, or images just by one click. Save, preview and publish the landing page while customizing. Choose from Buying a New Domain, Connecting to an Existing Domain or Updating Your Temp IMC Url after you have completed the landing page. Caters the brand new site designer or advanced online marketers. Landing page and site designs can be accessed and edited after creating a free account. Connects website to a domain. Gives access to unlimited hosting and bandwidth, a custom email address, advanced SEO, premium support, and many more. Extremely advanced and customizable process to create web landing page. IM Creator’s Premium Plan costs you $9.95/month and that gives you the ability to create unlimited landing pages with unlimited traffic. It also has a Pro plan with some extra features that cost you $250 per year. This pricing is good though, but how good if you pay a few more to GetResponse and Get its Email Tool and Landing Pages Creator both together at one place and in a very reasonable price. We have discussed about both the tools. The mutual purpose that they both serve is that they cut the cost of any business and let the business create websites and send emails easily and in the least possible cost. But think about it, why are you going to spend on IM Creator for creating a landing page while GetResponse provides this feature along with its email plan? So you get both (email tool & landing page creator) at the price of one. And even GetResponse’s Landing Page Creator provides better features that IM Creator’s.